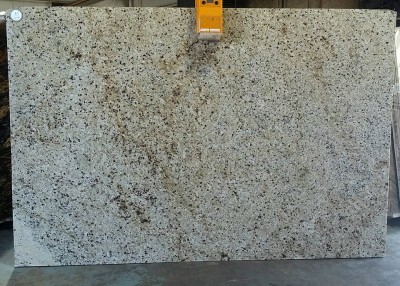 Giallo Fiesta granite is quarried in Brazil. It is a yellow stone that features white and grays, paired with warm creams, taupes, and gold. When viewing Giallo Fiesta granite countertops from a distance, the gold and taupe colors are the dominant shades, with burgundy mineral deposits scattered throughout the slab. When the stone is looked at closely, you can see the various colored tones including cream, tan, and various golden hues. Giallo Fiesta granite countertops have slight veining that stretch across small areas of the stone creating a cloud like separation in the slab. The gold, taupe and beige tones mix together to form subtle waves that create movement. The pattern is inconsistent as it flows freely. It has a lot of variations from slab to slab. Because of the warm colors in the stone, Giallo Fiesta granite blends well with medium to light stained cabinets and neutral colored accents. White cabinets can also be paired with it for a light and clean feel. The white will pull the light colors out of the stone and enhance the countertop. Also with white cabinets you can see more clearly the various mineral deposits scattered throughout the stone.